Francois Carrier has style. He keeps a balance between sound, linear content and expressivity in ways that are original and enlivening. When he gathered his alto, his trio and guest Bobo Stenson on piano at the Vancouver Jazz Fest in 2002, there was some magic in the air. It’s captured on Entrance 3 (Ayler 106) and captured well. One thing, at least, is clear. Francois Carrier needs to be paid more attention. 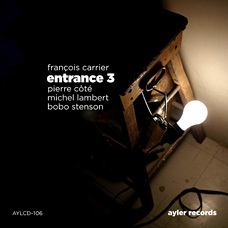 This is a freely expansive set of extended improvisations, with Pierre Cote and Michel Lambert (bass and drums) setting up turbulent, many faceted foundations for the flights of Carrier and Stenson. As I’ve been listening to this album I have come to realize that both (latter) artists have not been given enough credit. Stenson sounds his usual well-prepared, modern self, and if you hear him at work on this session you realize that he still has much to say, that we should be listening to him with greater attention. And Francois has the presence of a player that has found his own style and continues to perfect it. All of the four somewhat lengthy pieces are band collaborations. There are melodic motifs, rhythmic feels and tatoos that sound like they have been pre-planned. And then there’s plenty of smart, empassioned improvising. This is excellent music. Simply put.